We're looking for a Head of Fundraising to help FoodCycle grow. FoodCycle is an award-winning national charity delivering volunteer powered community projects across England. We build communities in our projects by combining surplus food, volunteers and spare kitchen space to create nutritious, three-course meals for the community. We have grown to 40 projects in 10 years and open our doors every week to 1,500 people. As the Head of Fundraising, you will be supporting us to serve even more meals to vulnerable people across the country. The Head of Fundraising (HoF) leads on the development and management of the fundraising team enabling FoodCycle to both raise its profile and secure income to sustainably grow. This is a new role for FoodCycle. We have consistently achieved £600,000 income over the past three years with the help of the CEO and the fundraising team. This role is very exciting as we have seen significant growth this year and lots of potential opportunities. The HoF will lead, manage and inspire the team to continue diversifying and growing our income streams. The role will build on the success we’ve had with trusts and foundations, corporate partnerships, community fundraising and a strong online presence. 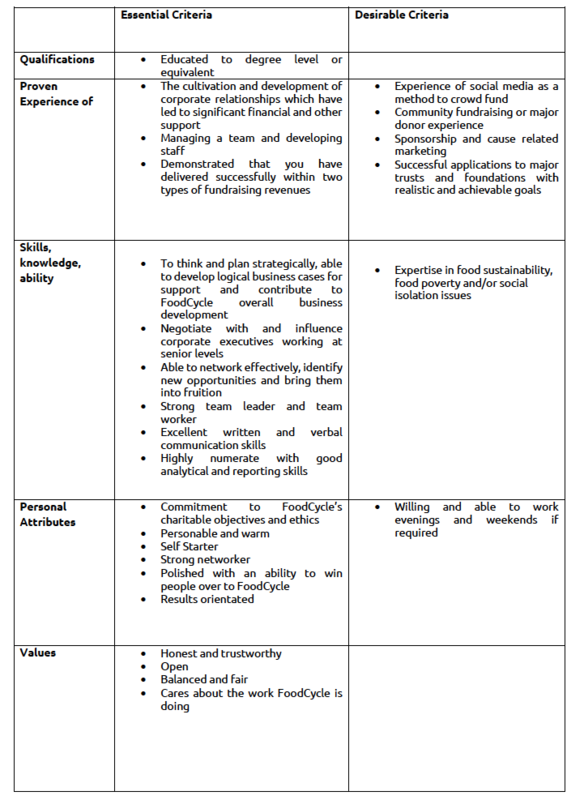 The HoF is a self-motivated role requiring excellent communication and analytical skills. 6. Develop a comprehensive set of reporting and analytics including KPI and retention reporting to deliver insight and analysis, which improves the effectiveness and impact of fundraising activities. 1. To lead the development of corporate partnerships, supported by the Corporate Partnerships and Fundraising Events Manager, including the development of sponsorship packages and materials, the researching of potential corporate partners and taking the lead in approaching and pitching to them across the country where FoodCycle operates. 2. Managing relationships with our existing corporate supporters, communicating and supporting them in their fundraising activities, to ensure they feel enthused and confident about their support for FoodCycle. 1. Plan, implement and manage the community fundraising programme of work which engages with local communities, recruits new donors whilst driving new revenue. 2. Set up a programme of work that maximizes the community opportunities where FoodCycle Projects operate across the country. 4. Ensure a robust stewardship programme is in place which maximizes income and develops relationships with local fundraisers, converting them to long term support. 2. Continually review the current calendar of events with a view to growing new events, income and delivering a dynamic programme of work which recruits new supporters. 3. Ensure a robust stewardship programme is in place which maximises income and develops relationships with event participants, converting them to long term support. 4. Review, develop and implement appropriate processes, procedures and guidelines to ensure event supporters receive a high level of support and top level customer care. 1. As part of the SMT, work in collaboration with the Chief Executive, and Head of Programmes to develop strategy for whole of FoodCycle so that our growth is financially sustainable. 6. Represent FoodCycle at fundraising events and third party events including speaking as required. 2. 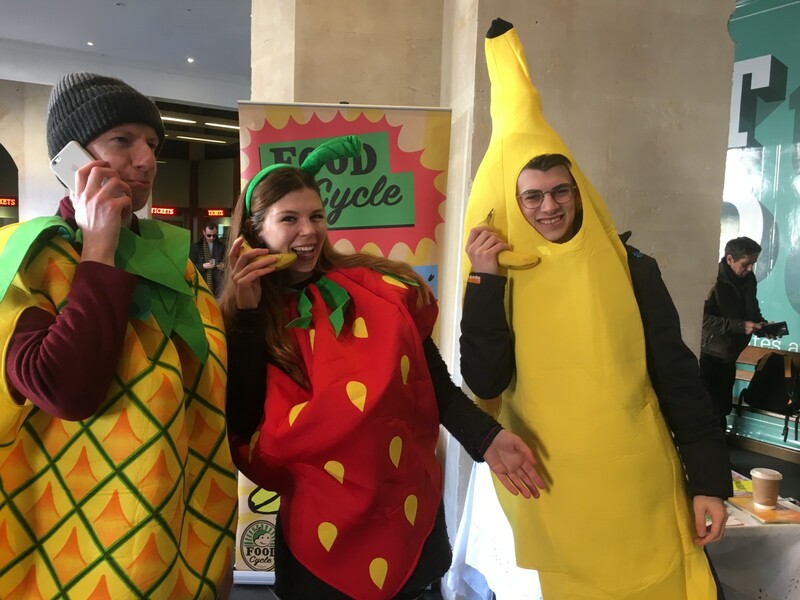 Develop a broad knowledge and understanding of FoodCycle’s programmes and the wider sustainability agenda, to ensure key environmental and social issues can be expressed confidently in public. 3. To lead by example and encourage all employees to conduct their activities in a similar manner to reflect the values of FoodCycle. Pension: There is a pension scheme available – new staff are automatically enrolled after three months unless you choose to opt out. Team working: We are a small but great team – super supportive and always willing to help each other out. What to send: A CV of no more than two sides, and a covering note/letter of no more than two sides explaining why you are suitable for the role.